Throughout the history of the library of the Museu Nacional, numerous documents have been incorporated through purchases, exchanges and donations. In this way, the library collection has ended up being of major value to study and research in the artistic field. The acquisition through purchases are carried out by means of a close collaboration between the librarians and the curators of the museum. While on the other hand, the donations have been enriched to a great extent thanks to donations such as that of Eduard Toda (1933), Lluís Masriera (1934) or the bequest of Apel·les Mestres (1953). With regard to the exchanges, the library has spent more than 20 years managing these types of acquisitions very successfully. Proof of this has been the incorporation of almost 12,000 monographic publications by this means over the past 12 years and numerous issues of magazines. ■ They constitute a privileged way of diffusion and permanence of our own editions, given that they are destined to libraries or documentation centres of similar specialisations. ■ The load is lightened on the budget of the centre both through the exchanges and with the donations. ■ They provide access to a bibliography that, in the artistic field, and given the characteristics of the publishing institutions (museums, academies, associations, town and city councils, banks, saving banks, companies autonomous governments, etc. ), in some cases don’t reach the market. ■ They keep open an interlibrary collaboration in other tasks such as the obtaining of documents, consultations and documentation in general. In this way, a network of contacts and knowledge is created between libraries of which all the parts can benefit. ■ A way out is achieved for a publishing collection of quality for many institutions, in such a way that it avoids the accumulation of publications in the limited storerooms of the libraries. 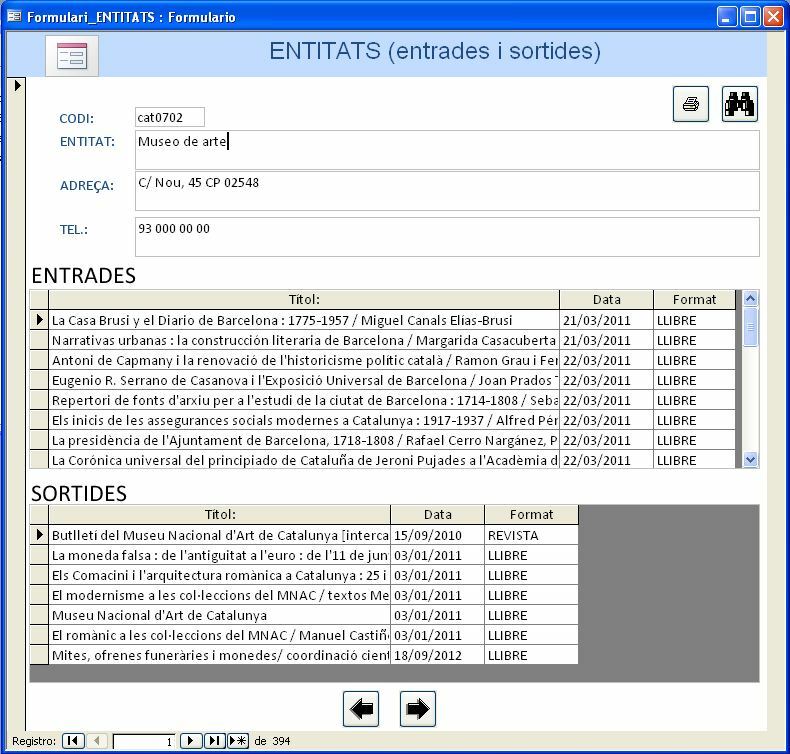 How does the bibliographic exchange in the library of the museum work? The Joaquim Folch i Torres Library of the Museu Nacional has had a specific exchange department since 1992. Its priority aim is to complete the collection of the library. What do we exchange in the library of the museum? ■ Publications published by the museum: exhibition catalogues, guides, conference proceedings, etc. In general the intention is to maintain the exchange of one publication for another. Even though we don’t manage to do so in 100% of the cases, it is however compensated, given that it often serves for us to achieve a greater visibility of the institution or to obtain rare documents. Now, more than ever, it is very important to take advantage of any opportunity so as to reduce the expenses of the centres as much as possible. Therefore, fostering bibliographic exchanges in museum libraries today signifies a method of acquisition of major relevance so as to continue guaranteeing the quality of the attention of the users. Do you know this method of acquisition used by the libraries?